Next time someone sends you a text message, think about what it would be like to respond with an augmented reality keyboard on your fingers. If this sounds like a good idea to you, then you’ll be happy to know that Samsung might be working on that for its rumored Google Glass competitor, dubbed as Galaxy Glass. The patent, which is now public, was filed last August at the World Intellectual Property Organization and South Korea’s Korean Intellectual Property Office. According to the patent, Samsung believes that voice control enabled for smart glasses allows for limited functionality, since loud environments won’t allow words to be heard clearly and soft environments don’t allow for any amount of privacy. In addition, any projector-based keyboards carry several drawbacks, one of them being the high cost of such a system. As seen in the pictures, Samsung’s solution is an augmented reality keyboard. Keys would be mapped onto the fingers of your hand “according to predetermined criteria,” which presumably includes what orientation your hand is in. You would then be able to “type” out letters by using your thumb to press on different areas of your fingers. One of the outputs resembles a version of T9, which you might remember as the painful way you had to type texts during the days of flip phones. 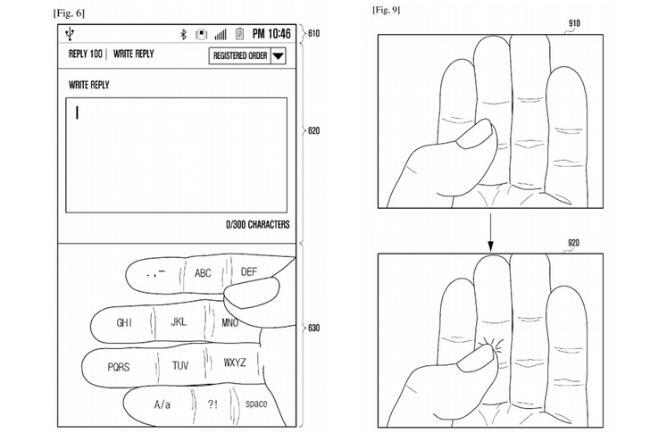 We’re not sure this will make it to whatever finished product Samsung has in mind, the company clearly has alternative gesture inputs in mind.